With the 2012 election season at hand, the topic of immigration is sure to come up in debates, attack ads, and street-level discussions. Specifically, the aspect of immigration that evokes the most passion on both sides of the political aisle is the issue of illegal immigration. As analysts and talking heads discuss this topic from a purely political position, Christians around the country should feel uneasy approaching such an issue as merely political in nature. After all, discussing immigrants and illegal immigrants in general can cause us to forget that there is no such thing as an immigrant in general; all immigrants are flesh and blood human beings, and all have intrinsic dignity and worth as created beings. Dr. Daniel Carroll’s Christians at the Border: Immigration, the Church, and the Bible is a book that seeks to bring a fresh perspective to this complex issue. Carroll’s contention is that Christians all too often approach immigration from an ideological rather than Biblically-informed standpoint, and the purpose of this book is to encourage all Christians to think “Christianly” about immigration. Although some may disagree with some of Carroll’s political and theological conclusions, Christians of all traditions can agree that immigration debate is not going anywhere, and as Christians, we need to be prepared to thoughtfully participate. Carroll has a unique perspective on immigration given his personal and professional history. Though predominately raised and educated in the West, Carroll has Guatemalan ancestry, which grants him a unique perspective given his experience in both the majority culture and Hispanic culture. Moreover, Carroll splits time between teaching posts at Denver Seminary and El Seminario Teologico Centroamericano (Guatemala). While it is clear that this Old Testament professor has a foot in both worlds, he clearly states his personal feelings: “I care for [the United States and Guatemala], although I must admit my deepest longings are for my Guatemalan roots” (18). I found this a rather odd admission, although it does not take anything away from the rest of the book. In fact, Carroll’s overall presentation is balanced, thoughtful, and not driven by ideology. In the Introduction, Carroll lays out his modest goal for this book: “My intention is to try to move Christians to reconsider their starting point in the immigration debate…It is designed as a primer for a more biblically and theologically informed approach to the topic” (19-20). Chapter One is something of a whirlwind tour of the last 150 years of Hispanic immigration in the United States. Included in this chapter is a discussion of the relationship between Hispanic immigration and national identity, economic realities, and the Christian Church. This was the weakest section in the book, as I was reminded again and again that Carroll is an Old Testament scholar and not a sociologist, political scientist, or economist. I was most troubled by Carroll completely leaving out the Constitution in his discussion of national identity (40). As G.K. Chesterton once remarked, “America is the only nation ever founded on a creed.” This historical reality also needs to inform the immigration debate, although it is ignored by Carroll. After all, as American citizens, it is the Constitution and not ethnicity or race that provides us a national identity. The strength of this book is found in Chapter Two through Chapter Four where Carroll analyzes the Old and New Testament passages relevant to immigration. Chapters Two and Three deal with the OT concepts of hospitality, forced migration, hunger, and legislation. Chapter Four addresses the NT passages on Jesus and immigration, sojourners, and Romans 13. In addition to the exposition of biblical texts, Carroll also provides “Implications for Today” throughout each chapter. One of the especially important passages Carroll highlights is the Creation account in Genesis 1 and the Christian understanding of the Imago Dei. He rightly points out that every human being is created in the image of God, and this must always be the starting point for Christians in this discussion (67). Chapter Five concludes with suggestions moving forward. Again, Carroll avoids any partisanship and instead gives some broad principles for future Christian engagement. Christians at the Border is an important book for Christians who want their political positions shaped by their Christian faith rather than the other way around. 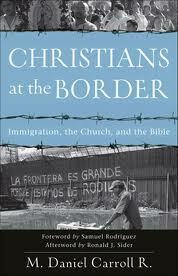 Carroll succeeds in driving the reader to think about immigration first and most importantly, as a Christian. This book should be considered essential reading for any Christian who wishes to engage this contentious issue for the cause of Christ.